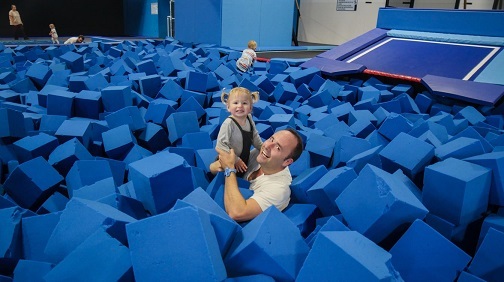 Head down to Chichester Gate and bounce, flip, flop and laugh your way to a spring-loaded good time with Air Arena Trampoline Park. Whether you’re planning a family day out or just feel the urge, there’s something to put a spring in everyone’s step this half-term. As well as open sessions for everyone, special activities include Helping Hands, for children and adults with learning difficulties, who may enjoy the benefits of trampolining accompanied by an adult. Toddlers and children aged five and under are welcome every day from 9am-10am. During term time, children aged seven to 16 can be involved in classes to improve their skills through graduated lessons in an award scheme as they progress while adults can enjoy AA Fitness, a full body workout tailored to maximise endurance and help improve fitness. Friday evenings are for disco sessions, for 11-17 year olds, while parties, to include refreshments as well as bouncing, can be organised for all ages. A first-floor cafe offers drinks, hot and cold snacks as well as ice cream sundaes and waffles for jumpers and spectators at the venue. Air Arena is a member of the International Association of Trampoline Parks and meets its highest standards of safety. Children under 12 must be accompanied by an adult and a safety video film is shown to everyone before they can start bouncing. At busy times, it’s advisable to book at the park to save waiting as numbers are limited. Opening hours from February 18-24 are: Monday-Thursday: 9am-8pm; Friday: 9am-9pm; Saturday: 9am-9pm; Sunday: 9am-8pm. For enquiries and to book, visit the website at: www.airarena.co.uk or call 01243 940530.